Why is my first bill bigger than normal? When do I receive my first invoice? Can I have a copy of an invoice? When is my invoice due for payment? Can I make a one off payment against my invoice from my bank account? Can I make a one off payment against my invoice from my credit card? Can I change my stored payment? What are the additional charges on my invoice? Why did my stored payment method fail? Most customers will be on a billing cycle from the 1st to the last of the month, however you could be on a billing cycle aligned to any day of the calendar month. 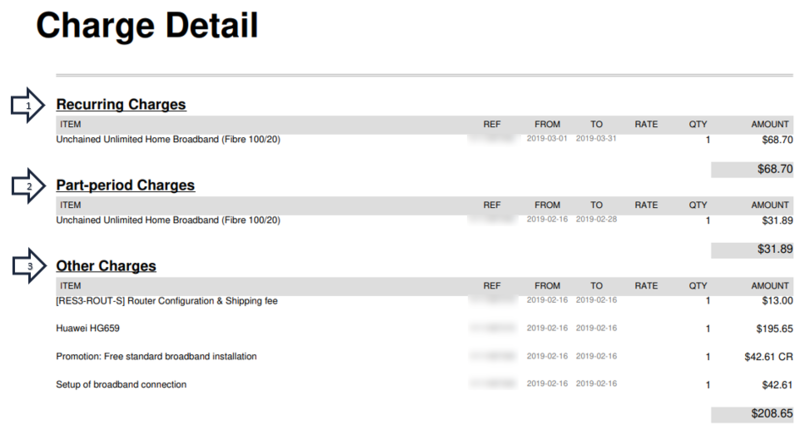 1) Shows the charges that you should expect to see month to month on your invoice. This can also include Hardware Rental and Calling Plans if you have requested them. Note that your subscriptions are billed for one full month in advance. 2) Shows the charges that cover the period from when your subscription went active, until the end of the current billing cycle. You won't see these in subsequent months unless you add another subscription to your account. 3) Shows any one-off type charges that cover items such as purchased hardware, shipping and promotions. You shouldn't expect to see these in subsequent months unless you purchase additional hardware etc. Your invoice might also show any calling charges that fall outside the calling plan that you are one. These will be charged retrospectively on the following invoice. Your first invoice will be sent in line with the commencement of the first full month e.g. If you are connected 15th June, you will receive your first invoice early in July. This will cover the period from the 15th June – 30th June, as well as the normal month in advance between 1st July – 31st July. Yes. A copy of any previous invoice can be provided via Email. Please call our Billing team on 0800 477 333 or email billing@voyager.co.nz to request this. One off payments can be made directly to our bank account 12-3221-0092790-00, using your account number as the reference. Your balance will show on the invoice that we send each month. If you have made a partial payment and wish to know the current balance once payment has been received, please contact our Credit Services team on 0800 477 333 or via email credit.services@voyager.nz to have this confirmed for you. Cost to create the account and any associated services (including Premise Wiring if requested). A partial charge for the service calculated at a daily rate from the time the service was established through until the end of the current billing month. This aligns the customer's charges with their billing cycle. Standard month in advance charges for the service(s) subscribed to. These are the charges that your customer should see month on month. Any costs for calling from the previous month that weren't covered in the customer's calling plan. See Voice Rates and Bundles for more information on calling plans. Please contact Credit Services on 0800 477 333 or via email credit.services@voyager.nz to confirm if your service is suspended. If your payment details have changed and we haven't been advised this will cause the payment method to fail. Please contact Credit Services on 0800 477 333 or via email credit.services@voyager.nz to have this checked for you.